World Rugby's proposals to revamp the international game have been met by fierce opposition from some of the world's leading players. The sport's governing body wants to combine the northern and southern hemisphere calendars and form a 12-team World League starting in 2020. It would lead to more international matches, with International Rugby Players' (IRP) president, Ireland fly-half Johnny Sexton, calling the proposal "out of touch". World Rugby have insisted their commitment to player welfare is "unwavering". 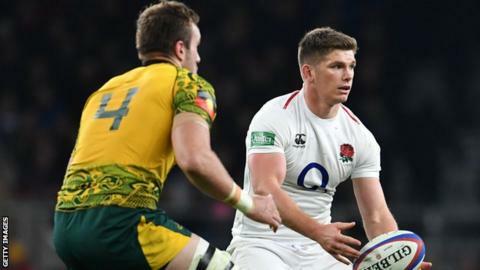 England captain Owen Farrell added: "This proposal shows no signs of improving an already difficult situation. "Players are definitely open to discussing a new global season but what we develop has to work with the club game in order to reduce conflict, deal with player release issues and make sure their welfare is looked after. "The proposal presented to us at the moment doesn't seem to have considered this properly." World Rugby said the players' opposition was "surprising" as the two parties were still in talks, and IRP had made "some assumptions" about the proposed calendar revamp which "are inaccurate". The proposal presented to IRP suggested the 12-team league would not have promotion and relegation, and would leave the Pacific Islands and Georgia marginalised. Former All Blacks centre Conrad Smith, now on the board of IRP, told the BBC they were under the impression the latest plan was ''almost a done deal''. However World Rugby sources insist they will not exclude the Pacific Islands, and they fully support the concept of promotion and relegation in a bid to grow and expand the game. "Important matters such as playing load and emerging nation opportunities are at the heart of constructive dialogue on the overall concept," the World Rugby statement added. What are World Rugby's plans? In September, World Rugby said it wanted to change the international calendar to enhance the "excitement, significance and value" at Test level, replacing summer and autumn 'friendlies' with competitive matches. The 12-team World League would see every nation compete against each other, either through the Six Nations, the Rugby Championship, or through July or November Tests. As part of the latest proposal, the USA and 2019 World Cup hosts Japan would join New Zealand, Australia, South Africa and Argentina in the Rugby Championship, with the Six Nations operating as usual. Under the World League format, teams would play each other once a year, with semi-finals and a final to be held in the northern hemisphere in December. The World League would not be held during World Cup years. On Thursday, World Rugby sought to distance itself from the idea the World League would not include promotion and relegation. 'Ring-fencing' the league would - in effect - end the hopes of emerging European sides like Georgia, Russia and Romania as well as the Pacific Island nations of Fiji, Samoa and Tonga of getting more regular competition against the top nations. Georgia coach Milton Haig told BBC Sport they had received no encouragement or assurances over their future in the proposed calendar. "I know our president hasn't been involved in those talks. You would hope when they look at this expansion, it is for the good of all and not a certain few," he said. However if the World League was to have promotion and relegation, that would need to be enforced in both the Six Nations and the Rugby Championship. Despite Georgia's pressing claims, the Six Nations has firmly opposed a promotion and relegation system, and it is this lack of uniformity in approach across the hemispheres which has contributed to the current impasse. What do the players say? The IRP council of almost 40 players, including nine of the world's top teams' international captains, discussed the proposals via conference call on Tuesday. Current World Rugby player of the year Sexton said: "While players gave this idea a cautious welcome when we met at the end of last year, it now seems like a commercial deal on the future of the game is being negotiated at a rapid pace with little consideration given to the important points we raised with World Rugby in November. "The issue of player load has never been so topical. However, it needs to be properly understood. "To suggest that players can play five incredibly high-level Test matches in consecutive weeks in November is out of touch and shows little understanding of the physical strain this brings." Samoa captain Chris Vui said: "For countries in this bracket and for Pacific Islanders in particular, our biggest issue has always been the 'club versus country' factor. "We feel a 12-year deal is not workable, particularly when it presents no hope of advancement during that period. "This will have the dangerous knock-on effect of luring senior players away from their countries and more towards the clubs, which is the exact opposite of what we're all trying to achieve." International Rugby Players chief executive Omar Hassanein said World Rugby had been made aware of the views of players on several occasions. "World Rugby are failing to respect the players' views and genuinely engage on the issues," he said. "It will be interesting to see their approach in the coming weeks knowing the current proposal does not have the players' support." World Rugby have said discussions are ongoing with the various stakeholders, with Nigel Melville of the Rugby Football Union adding the proposals have yet to be finalised. "I'm not sure this is the answer, this is a recommendation, something put forward for people to discuss," Melville told the BBC. With many leading rugby nations struggling financially, the proposed World League is designed to make more money for the international game, while World Rugby want to replace the current June and November 'friendlies' with more competitive matches. However, some of the world's most high-profile players have slammed the concept, which would result in more international games rather than fewer. This dilemma between making money and player welfare is at the heart of professional rugby and driving a wedge between players and administrators - even though the desire to increase revenue is in part down to rising wage demands from players. On top of this, any proposals that would freeze out the Pacific Islands and Georgia would be an indictment on World Rugby's ambition to grow the game. As it stands, the World League will likely create as many problems as it solves.